Currently the primary site candidate provides coverage for Fauquier’s EMS services along with other government radio coverage. Fauquier County is just west of Washington DC well outside the beltway. 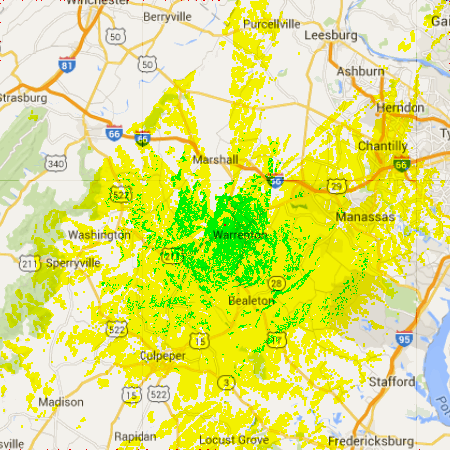 The map and coverage reveal the UHF coverage for the 9600 bps access system. Warrenton is the county seat and benefits most from the primary site’s coverage. The “Washington” shown on the map is not Washington, D.C., but is Washington, Virginia. DC is to the right of this map. The planned speed for any VAPN UHF port is 9600 bps. As the KYPN site testifies, once difficult-to-find equipment is now routinely built into many of today’s COTS radios. Testing in flat and hilly terrain similar to the Piedmont and mountainous portions of Virginia suggests a 9600 signal survives well enough to justify its use over 1200 bps. Our wish list will include adding remote UHF access ports in other parts of the state while avoiding the “connect-to-a-node-through-another-node” concept. While technically feasible, the VAPN will not use Internet port linking of any sort and will abide by the “RF Only” dictate.